Ryan Levesque is making a name for himself as a marketing expert, coach and consultant. In this interview, James Schramko gets him to reveal some of his history, the secrets behind his growing business, and his philosophies in life. 06:21 – What’s the big deal? 42:43 – Are you slow at hiring? 55:24 – How do you know you’re having an impact? James: James Schramko here. Welcome back to SuperFastBusiness.com. Today, I’m doing another story-based podcast, which is going behind the scenes with a successful and somewhat popular entrepreneur as of late. I want to welcome onto the call Ryan Levesque. Ryan: James, thanks so much for having me here. I’m thrilled to be here, man. James: Thank you for coming on. I know that it’s a busy time for you right now. We catch up regularly. So over the last few years, we’ve come from complete strangers to close contacts and I dare say I would consider you a friend now. James: I’ve done the hamburger experience in the Tesla. 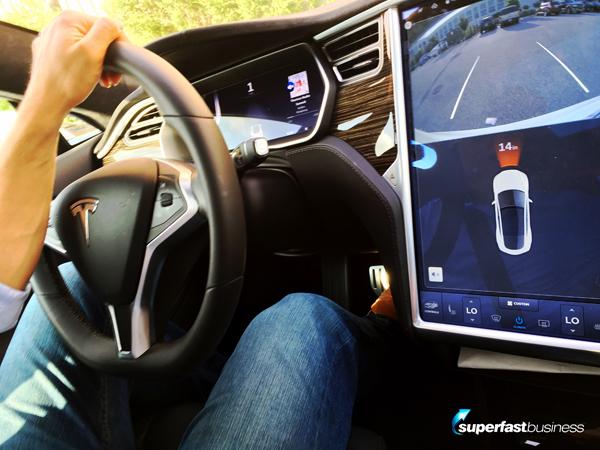 I know you wouldn’t trust someone to hold on to their hamburger while you’re driving your Tesla. Just anybody. I feel I’ve made it to the right sort of situation where I’m comfortable to call you a friend. Ryan: It’s a rite of passage, yeah. James: Yeah. Very impressive. iPhone on wheels. Thank you for the experience. Now of course, I did that in Texas because you kindly invited me over there to find out more about what you’re doing and to get more context because of the projects that we work on together. The more we know about each other, the easier it is to synchronize in. I thought, I’m in this privileged position where I can ask you some questions behind the scenes if you want to share some of it publicly that maybe people aren’t aware of and that might help someone else who’s on their journey to finding their thing and becoming a household name in the online space. So would you be willing to share a couple of behind-the-scene insights? Ryan: For you James, I’d be happy to do that. James: Fantastic. Alright now, just for context, if you’re listening to this and you don’t know who Ryan Levesque is, I encourage you to go and listen to the previous episode that we’ve done on SuperFastBusiness called Ask Your Way to Profit with Ryan Levesque. That talks about Ryan’s thing, which is all about asking, and surveys, and you’ll find out about quizzes, and segmentation, and micro commitments, and buckets, and all that. That’s not what we’re talking about on this episode. In fact right now, because Ryan, at the time of recording, there’s a launch going on for your home study course, and I’m sure everyone’s getting all sorts of videos, and emails, and education about this. The material you’ve been sending out is very high caliber. I applaud you. I went through your PDF last night actually. You pretty much give away the entire system to people who are just interested in finding out about what it is. That’s quite an interesting strategy. Do you find that’s effective? Ryan: Yeah. You know one of my mentors who you know, Dr. Glenn Livingston, he taught me, he said, “You know, if you give everything that you know away for free, people will pay you to hear you tell it to them again.” Now I think there’s some truth to that. I don’t know that it’s as straightforward as that. I do think there’s some things that you do want to hold back and make available for your paying customers. But the idea is you really want to lead with your best foot forward. James: Oh I’m glad you said that. I want to jump in there because we did that podcast over a year ago from the time of recording this. I already had levels of segmentation in my business because I was aware of it from the decade before. But I hadn’t segmented the very, very front, and I hadn’t segmented the very, very back. What I’m talking about here is I didn’t quickly enough find out about what people were interested. They were coming via blog posts, and we were tagging them with segments there. But I never tagged my front opt-in. And when I’m talking about the back, I’m talking about after someone actually bought. I haven’t been segmenting my onboarding. And because I talk a lot about subscriptions and memberships, a lot of people in my community are also doing that for their pricing and packaging, which we’ll get to in just a minute, I now realize that I can have a better experience for a paying customer by having a more relevant conversation with them. So even though I knew about this from last year, and I read your book, the thing that really prompted me to get stuck into this was when I came to your event. What I did then was I had homework to do, and I had a deadline. And because I was going to that event, and because I took it seriously enough to hop on a plane and accommodate myself over there, I actually applied it. I sent out a survey to my customer list. In fact, this morning, I saw a very well-known internet marketer send out a very similar survey, maybe slightly different in the way they executed, but there’s no question it’s a Deep Dive Survey, which is the name you’ve put on this process. Basically, if you’re not doing this, you are missing out. That’s the point. It took a deadline for me to do it. I think that this is going to come up in the conversation. It’s just the right time because I got this thick workbook, I got research data from my survey, I had interactions with people in your team to help me understand how to actually use that information, and there are so many subtle nuances. Someone in my community said, “It’s just a simple idea, but people are making it complex to sell it for a lot of money.” What would you say to that? Is it really a simple idea? Ryan: It’s a great thing to bring up because I think like many things in life, it’s easier to say, “Star Wars was a trilogy about a kid who found out his dad was the bad guy.” What’s the big deal about Star Wars? It’s a multi-billion dollar worldwide phenomenon. James: Lego – it’s a few little bricks that snap together. Ryan: It’s just stupid plastic that you stick together. What’s the big deal? James: I know you love your Lego. Ryan: Yeah, I love Lego. And pick any sport – basketball. What’s the big deal? You’re just putting a stupid ball in a metal cylinder. What the hell is the big deal? Ryan: But it’s the nuances that matter, right? When you perform at a high level, when you’re a three-year-old, and you’re in your living room, and you’re throwing a ball in a hoop, that’s all it is. It’s just a round ball and a hoop. But when you’re performing at a high level, if you want to be world class, if you want to be a leader in your industry, like a world-class basketball player, the nuances matter; the angle at which the ball leaves your fingertips, the height at which that you jump, the technique that you apply in spinning the ball, all of these things, there’s a million nuanced pieces to this that make all the difference. James: I sort of smiled, because I was at the conference, and the workbook was as big as an old phonebook. If you’re a young listener, phonebooks used to be this really thick things that they dropped off at your house. Most of it is templates and examples. There are subtle differences between it. I’m glad we covered that. The other thing is, getting out in front of everyone and telling your story. I think this is the fascinating part of the whole thing for me. How did Ryan go from what you were doing to producing high-level workshops with material that’s got your brand emblazoned on the front, with a lovely font I might add. 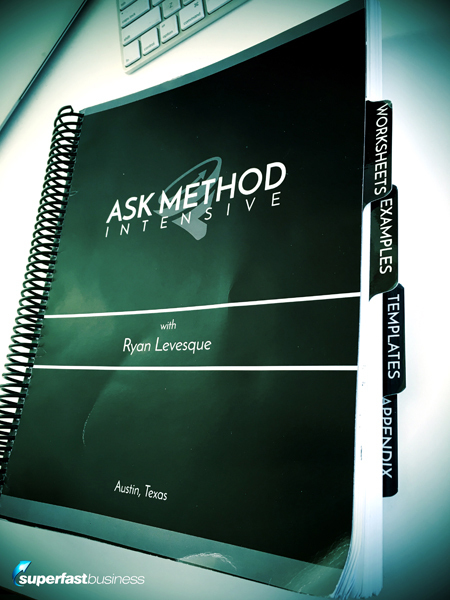 You are known for this thing – Ask method, that’s your thing. A lot of people listening to this haven’t found their thing yet. When I did my buckets, when I did my Deep Dive Survey, there were four buckets that came through clearly, and I would like to ask you some questions relating to the buckets that are the challenges my audience are facing, and one of them is sales and conversions. A lot of that has to do with finding their offer that coverts. How did you discover that this is going to be your thing when you started out selling orchid stuff and all sorts of other weird things? It’s like my friend Ezra Firestone, who used to sell wigs and stuff, and now he sells quite a lot of beeswax or whatever it is in those tubs of goop that he sells tens of millions of. How did you find your thing? There must have been a transition. I know that the first half of your book is dedicated to the story, but I’m not buying it fully. I reckon there’s gotta be something else. Ryan: [laughs] Yeah. Listen, when I first got into this world that we call internet marketing, I just wanted to quit my job and replace my income. That was it. James: That’s the same for me. That is exactly the same for me. Ryan: That’s it. I mean I was working in insurance, and basically, here’s my aspiration – I was sick of having to wear a suit; I had a job that I actually had to wear a suit like five days a week, I was sick of having to show up at the same time every single day, like I have to show up no matter what, punch in the clock, be there at nine, end at five. Some days, I’d have nothing to do. I felt like I was wasting my talent. I thought that even though I was in like a pretty respected job, I was coasting in many ways. That was creating a lot of anxiety. That’s why I did my thing in the first place, and I wanted a location-independent business. James: I’m going to prise you out of Texas over to Manly here. Ryan: Yeah I know, I’m excited. I just got the green light as you know from our conversation yesterday. We’re going to bring the whole family. So I’m super excited. My first time to Australia. James: Wooh! Ryan Levesque coming to Australia, you heard it first at SuperFastBusiness.com. Now I’m super looking forward to that. In fact, I’m so excited, I’m giving you multiple presentation spots at my event because it’s a rare treat for our event attendees to have access to you. I actually asked for you too. There you go. There’s some irony. They’ve asked for Ryan Levesque, and Ryan Levesque is coming. Ryan: I’ll take it. I’m really looking forward to doing it. I mean, it’s really an honor. It’s my first time to Australia. I’m a little bit nervous. I hope I’m not going to be attacked as the ugly American abroad. James: Yeah of course, everything here will kill you. James: On a positive side, we’re not so much into guns or anything. Ryan: Yeah I know, living in Texas. James: Just a natural phenomenon you’ve got to watch out for. We’ll protect you. So you’re in China, and you wanted to make it work. James: You can read the book with the story. I recommend the book. My book is dog-eared from chapter 12. You know that I love part two. It starts on about page 63, that part there, that’s been worked hard on my book. I cannot think of a business online who shouldn’t be applying this. You’d lay out the actual words to use, and that’s what I liked about it. It was actually quite easy to follow. The technical part was the most interesting. James: It would just be between you and I and a couple of thousands. Ryan: You and me and ten thousand listeners listening to this. Ryan: Yeah. My entire life has been ruled by fear. I have been a very afraid person. Growing up in school, I was afraid to fail. I was a very good student, but I was just terrified at failing. Terrified graduating from college but not having a job. So I got a job at the beginning of my senior year because I wanted to be safe. Just terrified, just afraid, and a lot of fear in a lot of what I had done. So when I launched our first little business, the orchid business, immediately, my response wasn’t elation, it was fear. It was, ‘This is going to crumble.’ I was so afraid it was going to fall apart, so I rushed to create another business to diversify just in case something happens. And then again, I was afraid that those two businesses would crumble, so I decided to start working with other businesses and do the marketing for them. It wasn’t called the Ask method then, but it was basically doing what I now teach, because I was afraid. I was afraid everything that I was going to build was going to crumble. I grew up very modestly and my family very, very fear-based, very much like, ‘Gotta save, save, save, you never know what’s going to happen, count the pennies, save money.’ Very much that mentality. So I had a lot of fear in my life growing up and just afraid. Fear of loss really. Fear of failure. James: I could totally relate to it. The late 80’s, there was a bit of a financial meltdown over here, the recession. That kind of forced me out into the workforce. I had to go and get a job instead of study because studying wasn’t really an option anymore. I remember after I quit my job about eight or nine years ago now, I was speaking at a conference at the Gold Coast. There was 500 and something people at that, and I was due to present that day. When I had a shower, I suddenly had this realization that I can’t be sacked from my job, which happened to my dad, and it was humiliating for him to lose his high-power job, car, and house. It was just devastating emotionally. I feel for him immensely because he was my superhero. I had this release of tension, and I remember weeping in the shower at that realization that I’d gone past that point. What’s really interesting at my most recent event, and I’m talking about this year, and we’re talking about eight or nine years since I quit my job, I was talking to my friend Shaun who helps me with my events, he used to help me with every single event, he’s amazing; and him and I compared notes, and we both still occasionally have nightmares about the car industry. It was so aggressive. It’s like post-war trauma of some kind. When we found our other friend Richard who comes to my events, he has the same thing. So I think we can get ourselves into these environments that are so unhealthy for us that that will to break from it is a lot of that driver to find our thing and to escape. I imagine when you found your formula, which wasn’t called Ask then, but when you found a repeatable system that seem to work despite your expectation of failure, which I say is a very Robert Ringer philosophy, ‘Expect the worst, and if it goes better, great.’ I imagine once you found that, you actually a found a system that could generate a self esteem, and praise, and make you feel good, that it was the thing you could be certain of. Is that something like how it went? Ryan: Someone like that. It was someone like that, maybe it was him. James: I was right there at the beginning of that, doing the exact model. Ryan: Yes. That’s who it was. I can’t believe it. I haven’t heard that name in ages. You know what I’m talking about, right? James: It was the Offline Gold thread. Ryan: Yes. Yes, yes, yes. Ryan: Holy crap, I can’t believe it. Yes. James: If you find that thread, I was right there at that time, and that is when I hopped on a plane and went to America to my first online conference – Underground 4. Ryan: So was this guy legit? I can’t figure out if he was legit or not. James: Absolutely legit. He’s still around. I saw him recently comment on one of my Facebook posts. Ryan: That’s crazy. So the takeaway from his thing, it was all about like becoming a local area consultant. But at that time, I hadn’t done any client work. I was just like in my bedroom, basically doing my little orchid business and then the other business that we’d started, and I came across that. The big takeaway I had from that all came down to one word, confidence. That was the thing. If my word is Ask, if I were to say he had a word that I took away from his training, it was confidence. I remember he used some graphic language, I’m not going to swear, but is it OK if I repeat quotes and not shoot the messenger? James: You wouldn’t be the first person. Ryan: OK. I remember he said to me, “Here’s how you do it. You just walk in that room, and whatever number you have in mind, you just walk into that room, you give that number, you tighten up your a** hole, and you shut your mouth.” That image just stuck in my mind so much about having the confidence, the balls, to start charging a huge amount of money, what I thought was a huge amount of money at the time for that type of work. I realized that’s what separated the A-level players from B level. It had nothing to do with skill, it had nothing to do with talent, it had everything to do with confidence. For me, I realized that for me to get to the next level, I had to become really, supremely good at the thing that I was doing, so I could get on the phone with a client and just quote my price, and say what it was, and do it in pure confidence, and have a skill that I could lean on. So the skill that I started leaning on was my copywriting ability. That was before I developed and discovered Ask. I started realizing from people telling me that I had this ability to write nearly word-perfect copy on the phone, on the fly, just boom. Once I realized I had that skill, like my stupid human trick, I realized that I’d never be poor, like everything would always be OK. It was like that first turning point where my life wasn’t driven by fear. I realized I had this skill, this timeless skill that I could take with me no matter what it is that I do that was going to get me to the next level. And then armed with that skill, I was able to start charging more and more doing the client work that I was doing. I started charging a royalty. The first deal that I charged the royalty was one of those Andrew Cavanagh, just quote the number on the phone, tighten your a** hole, and shut your mouth, and wait for the other guy to say something, and they accepted it, and I couldn’t believe it. James: It’s amazing, the parallels here. Ryan: When you said that name, it was like, whoa, I mean that was like what, six, seven years ago? Ryan: 10 years ago. I mean that was like forever ago. James: Back then, that’s when I, it would be nine years ago, that’s when I was selling to local businesses for five and a half thousand dollars per month, and I kept those customers for seven and a half years straight. I was right there building my business, my community around people, and guess how my SEO business started? The SEO business that went on to generate over a million bucks a year, which I sold earlier this year. It was born with the first two clients that I was participating in that discussion about. So it would be a good eight, nine years ago at least. Ryan: So the thing with confidence, this takes us back to the Ask. So for me again, driven by fear, and launching my first business, I was so afraid I was going to fail, and really in my mind, I wanted a system, a methodology that basically eliminated failure points that like I could know with confidence that whatever I was going to do would be successful. What I realized was that every step of the way in launching a new business or getting into a new market, you could run these surveys. Surveys were a proxy to gauge how much demand existed, to gauge if you should go this way or that way, to gauge what the cost is going to be to acquire a customer because when you run a survey on cold traffic on Google AdWords or Facebook ads, and you know how much it costs you to generate a survey, there’s a math problem that you can estimate how much it’s going to cost you to generate a customer. And then you figure out, if you’re going to charge $50 or $100, whatever the price point is for your product, you can figure out if something is going to make money. So by eliminating that upfront risk, it immediately gave me that confidence I needed to go into a new market and start something new, and that coupled with the copywriting ability was the thing that really unlocked things for me from being just a guy in his bedroom who quit his job, being on Perry Marshall webinars, studying Dr. Glenn Livingston, getting all the Dan Kennedy stuff, reading Gary Halbert. Those webinars that we’ve all been on, 400 or 500 people on a webinar, I was lowercase ryan l. on those webinars. I was a nobody. I remember the first time I ever spoke to Perry Marshall, I was in China, it was when he was on a webinar and he did show up five minutes early, in Perry’s very slow, methodical way, he asked, “Who’s on this webinar from farthest away in the world?” And I was like, crap I’m in China, maybe I’ll unmute myself, heart palpitating, boom boboom boboom, “I’m in Shanghai China.” [laughs] And then he told the story about his brother, Brian Todd, who I later learned was his brother, it took me six years to realize that they were brothers. His brother Brian had spent a lot of time in China and spoke Chinese. I later met Brian at one of Perry’s conferences. But the point is, I remember those early days about being just so afraid and just being a guy in the crowd. That’s how we all started. That’s how you started. James: Yeah. I was an absolute nobody. I still had a job when that Offline Gold thread was carrying on, like a lot of people back then. It’s just fascinating to see who carried it through. James: I love these two keywords so far. I’ve circled “copywriting” and “confidence”, because I’ve noticed something, I don’t know of any super celebrity in the IM space who isn’t good at copywriting/persuading/selling. All of them, whether it’s Frank Kern, Ryan Levesque, Kevin Rogers, all these people can write, and they emerged to the top because they’re able to do things with words that other people cannot do. That’s like the oversimplification. It’s just words. Yeah, but it’s how you arrange them that gets a result. James: You went from scared to confident. It’s also by the way, that’s the key point that Dan Sullivan impresses upon people who do his coaching, it’s confidence. Ryan: I think the most important thing you need to protect as an entrepreneur is not your reputation, it’s not the money in the bank, it’s your confidence, because once you lose that, you lose everything else. James: And you need it too. I’m sure right now, when you put out a launch, everyone starts saying, “Ryan, get out of my feed. You’re everywhere.” Tell your affiliates to ask if I want this information. I’m seeing it everywhere. I imagine some people could get too confident, and they turn into a nasty personality. How do you control that? Ryan: The other thing too is confidence comes from your, your sh** has to work. When you put your 10,000 hours into something, that’s where the confidence comes from. You’re a dominating basketball player, you could step on to any basketball court in the world, and you know, you’ve got game. You step on to that court, your chest is popped up high, you see the guys playing on the court and you know that you can dominate that game. That doesn’t come by accident. That comes from hard work and 10,000 hours. So I’m not shy about it. I’ve put my time in. When I was working my last job in insurance, I basically was working two full-time jobs. From nine to five, I worked my insurance job. I came home, ate McDonalds, which I’m not very proud about, and then I would handcopy Gary Halbert letters, Ted Nicholas letters, Dan Kennedy letters, The Classics, Capel’s. I can’t tell you how many times I read Scientific Advertising, I actually hand copied Scientific Advertising by hand. I did all that sh** that people say. I put my 10,000 hours in. You put that time in, just like the guy in the gym when nobody’s watching, shooting 100 shots a day, every single day, for 10 years of his life, and you put that time in, you get confident. You can shoot the ball like Steph Curry without even looking at the hoop, and you know it’s going to go in before it’s even left your fingers. That being said, to answer your question around the antidote to becoming over confident is for me, I am so afraid. I’m still afraid of losing it all, I’m still afraid of making a misstep, I’m still afraid of making a mistake, and I think the true thing for me that I’ve come to appreciate is doing everything coming from a place of gratitude. Gratitude is like this magic weapon that we all have that whenever something happens in your life, good or bad, just approach it with gratitude. This didn’t go well? You know what, I’m really grateful for this lesson because it’s taught me that I was sloppy, and I don’t want to make that mistake again. Being grateful for making that mistake. When someone does something, when you generously came to Texas, which I am genuinely grateful for, to be the guest of honor at my mastermind, I’m so grateful because you could be doing anything. You don’t have to be there. You weren’t paid to be there. You just came. It’s a long trip. You’re away from your family, and you came, and people had universally in my mastermind, people rated it a 10 out of 10. It was head and shoulders the highest rated retreat that we have ever done ever. It’s a very similar group of people from one retreat to another. So people stay in this group for many, many years. And they came. When you did that, I’m extremely grateful that you did that. I think that’s the antidote, is just to not fake gratitude, not like yeah, you say you’re grateful, and you know, like a humblebrag, when someone, they say something on Facebook and you’re like, “Yeah, screw you,” you know? Like genuinely, manifest it in yourself that you feel grateful. And I think it’s not what you intended on asking me, but there’s a lesson in there, and I think this is one of the biggest secrets. I don’t know how to teach this, but it’s to have genuine empathy. Like, I have a hard exterior, anyone who knows me, I’m tough as nails, I grew up in a very tough household, shovelling snow at four in the morning, boring stories like that. That was my life. I hated summer vacation because it meant I had to work for six hours at home. I had to mow the lawn, do the garden, paint the house, whatever needed to be done. I actually liked school better, because summer vacation was hard. So I grew up in a pretty strict household, so I have a tough exterior. But you’ve seen me, like at our mastermind. I mean, we ended the mastermind, I can’t tell you how many times I’ve done a mastermind without crying. I always cry, I’m like a big crier, I don’t know why. But I think it’s important to be able to allow yourself to experience the full spectrum of human emotion. Everything from joy, to extreme anger, to pure sadness, to melancholy. The thing that makes me sad now that brings tears to my eyes is thinking about my kids getting older. Like that for me, I’m getting teary-eyed talking about it now, that to me, that scares me more than anything else. I lose my breath when I think about how fast my kids are growing up, and that makes me sad. And I think it’s important to be able to give yourself permission, especially as a man, because I know a lot of guys will be listening to this, and women too, of course… but as a man, to allow yourself to experience the full spectrum of human emotion, because that allows you to connect with people in a way that is special. And people will connect with you. And that is really just giving yourself permission to go there. And part of that, going back to the confidence thing, is allowing you to access memories in your life when you weren’t confident. Here’s a great story for you that I don’t tell. The one I was going to tell, I haven’t got to it yet. This for one, I mentioned to you. When I was in eighth grade, I thought I was hot sh**, because I was a really good pianist and saxophonist at my school. So I got this scholarship to go to this thing called SYMS, Summer Youth Music School, was at the University of New Hampshire, and it’s kids from all over New England, who come to this school for a summer school on music. And I get to class the first day, and you’re part of like the big band, with your individual musical instrument group, and I chose to do both saxophone and piano. So I’m hot sh**, I can play two instruments. And I get there, and this was the first sign of things to come. There’s three levels of the band, and I forget what they called them, but they’re like one, two, three. One is like the best people in this program, and they make you try out at the beginning, two is second best, and three is everybody else. I’m in three. That was kind of like first ego blow. But I’m like, oh, whatever, I’m very young. This was mostly people who are in American high school, so ages what, 14 through 18, and I think I just turned 13. So my excuse, I’m the youngest one there, whatever. Then I get to the saxophone group, and James, I am so far out of my league. I am in the wrong room by a country mile. And a week into this program, my parents come to visit to hear the first concert, and I was in the audience listening to the concert for like the level one band or whatever, sitting next to them, and I was crying my eyes out, begging them to let me go home, because I was so bad. Like, I was the worst kid there. And I had to do something that was absolutely humiliating. I had to play, I remember, Fleur de Lis, the song on the piano, in my piano group, I had to play it, and I hadn’t fully mastered the song. And you’re in this tiny little room with the piano, and 10 other kids, who are piano prodigies. And I’m playing basically this Chopsticks-level song compared to what these guys are playing. And I get in front of the group, and I’m playing it, and I have this breakdown, where I can’t get past this hard part that I get stuck. And the teacher won’t let me stop. She makes me play the entire song from beginning to end, and it was the most humiliating, embarrassing thing that I had ever experienced in my life. When I start thinking, man, I’ve got this sh** figured out, I go back to that moment. I take myself back to that moment, I take myself to the emotions of that moment, and I remind myself that there is always a room where you’re going to be that person. You’re always going to be that kid playing Fleur de Lis and can’t even get through the song without humiliating yourself. I do that to keep myself in check, because it’s true, no matter what game you are playing right now, there is a game, and you might be at the top of your game, you might be at the bottom of your game, whatever, there is a room out there where you will be that kid. And I remind myself of that often, and that’s just one of many humiliating, embarrassing things that have happened to me that affected me on a deep level. James: Yeah, we get a lot of things affecting us as kids, and I think one of the key points here is being able to access our memories and just remember some of the things that formed us. I used to be a bit of a Lego fan. I remember playing Lego with my neighbors out the front of my place. I took out this kind of picnic blanket and I had quite a lot of Lego, I was probably a little bit spoiled at one stage there, because my auntie would keep giving me Lego, they knew I liked it. So you know how when people know you like Lego, they keep giving it to you. James: And we were playing and playing, and my mom called for afternoon tea, and I went, had to go in and drink some tea and have a tomato and cheese Sao biscuit, it’s an Australian thing, probably. And when I came back out, we continued to play, but it just didn’t feel quite right. Anyway, the kids went away, and then years later, these kids were moving. And they asked me to come over, and they made this confession that when I went inside, they knocked off a good portion of my Lego. They pocketed it, and went home, and they gave it back to me. And I just remember feeling so devastated. The crime that had happened to me, that I was a victim of a crime. And I couldn’t quite put my finger on what wasn’t right, but there were just bits missing that I couldn’t reconcile, and then finally I found out. So I found out now, whenever I become a victim of a crime or whatever, it’s a little bit sensitive, because it’s a kind of a mean thing for someone to do, is to take from you. So I guess I’ve always protected myself a little more with insurances and a little more cautionary thing. It doesn’t help that apparently, according to my DNA sample, I’ve got a worrier gene, which is this slightly more developed hippocampus. I tend to make checklists and reduce errors. But I will attest to you as a person, I’ve spoken to you most weeks for a couple of years almost, and I’ve seen a range of emotions for you, and one of the exercises that we do together is we talk about your wins for the week, and we build in some gratitude. So no matter how hard it seems, or how off point something can get, there’s always something good going on that we should acknowledge. Like even if we’re breathing and we’re healthy, then that’s a good baseline to start from, even if someone’s done something bad in our business or there’s a frustration. I think, really, the important lesson here in going deeper into the Ryan Levesque emotions there is you have to have a balance between confidence and humility. I imagine it’s easier for someone, they’re on Facebook, and they’re seeing this super popular Ryan, everyone’s talking about how awesome Ryan is, and obviously a lot of them are doing it because they’re going to be incentivized, and that’s how the affiliate thing works. But they’re not just doing it for that. Someone like me, for example, would never promote a product or service unless I’m confident that it’s a good product or service, because I respect my audience enough to never lead them astray. I’ve sat in the room, I went through the workbook. I’m applying this in my own business. Right now, my team are carving my blog up into four categories and setting up tags by category so that when people visit us we can put them into the right information stream as quickly as possible. So the people saying nice things about you are genuinely saying nice things. And gee, they say some nice things. You must blush when you read the things they say about you, Ryan. But to get to that point, you’ve put in all of that work, you’ve studied your craft of copywriting, you’ve then learned from your other mentor where you’ve got this methodology, you’ve refined and advanced the methodology into a system, you’ve got the capability now where you’ve put this into really easy-to-understand mind maps and templates, which is one thing that I got tremendous value from. It’s good to have the idea, but it’s even better to see how someone implemented it from top to tail so that you can learn from that. I just want to talk a little bit about a couple of things that are hotspots for my audience and how they relate to you. 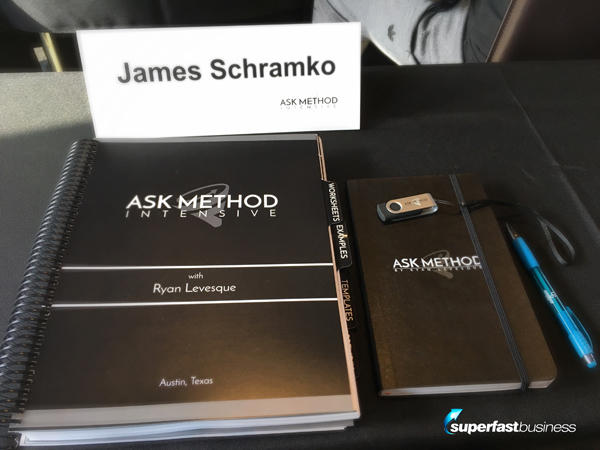 James: You’re now Ryan Levesque, you’re the Ask method guy, you’ve published a book, you have run $10,000 workshops, you’ve got a $35,000 a year mastermind, you have a team around you. 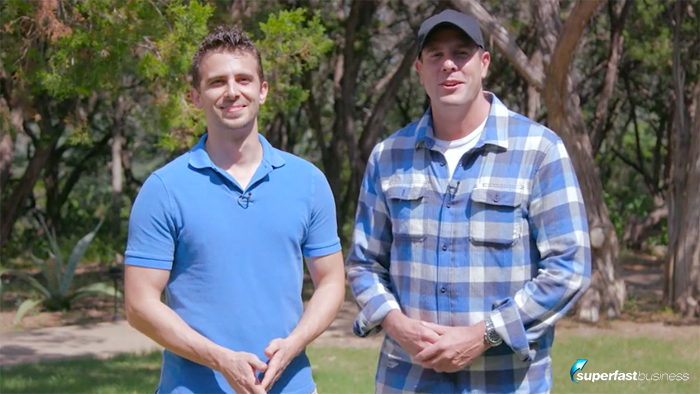 What were some of the things that changed for you going from a six-figure business, so that’s between $100,000, a few hundred thousand dollars, into the millions. What changes had to happen for you to move? In particular, what sort of things strike a chord as being a particular challenge that you had to overcome? Ryan: And this is an ongoing journey, right? It’s an ongoing journey. James: Luckily it is, I’d be out of a job. Ryan: [Laughs] Good point, fair enough. One of the mistakes that we made that held us back – when I say “we”, my wife and I, we started the business together. I mean, it was really my business, and I convinced my wife to leave her career to join me so we could build it together. James: Can I just jump in there? It is incredibly a common theme here that behind every successful person in business there’s quite often someone just in the shadows nearby that is the support, the pillar, the truth-teller, the bouncing board, the confidence recharger. I just wanted to point that out. It’s certainly been the case for me. And for most of the people who I work with, there’s often someone else. For Ezra, it’s his wife Carrie, for example. It’s such a common theme that I encourage people to acknowledge the ones around them who support them, because so many people won’t support you that when you find that rock, it’s such an asset in business. So continue on. The only person in the world that truly believed in me was my wife. That’s it. Like, she believed that I could do it, that we could do it, and so we did it together. But one of the mistakes that we made in scaling from six to seven figures, and I think in retrospect, we could have grown a lot faster, was we were really slow to hire, like, really slow to hire. You’d be surprised, I’m almost embarrassed to tell you how long she and I would stay up on a Friday night, put Netflix on, and be packaging orders in our living room. Like, far longer than you’d expect. We were doing that, ourselves, her and me. Like we’d bring my mother-in-law, she’d sit on the floor with us, and we’d be stuffing orchid books and DVDs on the floor while we put a movie on in the living room and order take-out. Like that was how we’d spend our Friday and Saturday nights. We were really slow to hire, and what I’ve learned now is I’m a lot more aggressive in hiring, and it’s being OK hiring ahead of the curve. So it’s being OK knowing that you’re going to dip into your profit, you’re going to be taking a short-term hit, knowing that you’re not quite ready to hire that next person, but you’re confident enough in yourself to get two levels forward. Does that make sense? Because when you hire, if you want to get from point A to B, well you can’t, because if you get point A to B you hire someone, you’re going to overhire, you’re not going to make any money. You’ve got to plan to get to C or D. And so you hire someone that’s going to get you from A to C, or A to D. And getting better and better at that, being comfortable hiring ahead of the curve, projecting what’s coming next, that’s been a big kind of shift going from six to seven figures. James: Yeah, team is one of my buckets, and it’s so true. I talk about the capacity marketing seesaw. A lot of people can’t hire because they don’t feel that they have enough sales to support it, and the Ask method fixes that. If your problem is you don’t have an offer that converts, just do your Deep Dive Survey, stop making mistakes on what you’re trying to sell, sell the right things to the right people, the right relevance, you’ll get the money. And then a lot of people, in fact almost six out of seven of the last people I had on my group call at the highest level, they are running out of capacity. It’s such a common thing, where your biggest problem is no longer finding something to sell, or what your thing is, it’s now trying to keep in front of the demand you’ve created through having good product and marketing properly. We’re getting 300 percent sales over the last year, 50 percent sales over the last year, or sold already this year what they planned to do for the whole year. Marketing’s just taken off, and the conversations I’m having at this high level all revolve around, on the marketing side, it’s all about segmentation, obviously, and on the capacity side, it’s getting the trigger points in place so that you have the right people coming on board just before time and you’re getting the right people who you can train properly and make them autonomous as much as possible, which is obviously a whole deeper topic. But absolutely, from six to seven figures, team has to change, and just like you, Ryan, I was the one doing everything by myself in the beginning, which was crazy, because during the day I was doing virtually nothing, running this huge team in a multi-million dollar business and at night, I was doing everything. And it just, it didn’t work out, it just didn’t reconcile very well. I was too slow to hire, and so it’s a really common challenge. Let’s switch topics. Same question, though. In that growth between six and seven figures, what’s happened with your personal productivity? I’ve seen you at your own events. I saw you do six days straight and still squeeze in videos to the side. You are a dynamo. Was it always like that? Ryan: And everyone, I would challenge that everyone on this call listening to this, you know what your thing is, you just haven’t realized it yet. It’s there, like it is there, and you’ve either ignored it, or you’ve overlooked it, but it’s there. I look at my kids. My two kids are two and four, and already they are so different from one another. Their natural personalities, their dispositions, the things that they grasp really easily and things that are a challenge for them. This happens at a very young age. And all of us, whether you believe in nurture, or nature, or some spectrum, some combination in between, I believe that all of us have unique talents that are there that lead us to what our thing is. And for many of us, we can do a lot of things. Like, we can get by doing a lot of things. We have to, right? If you’re an entrepreneur, you’re running your business, you have to do a whole bunch of things, it’s like the ultimate, most challenging thing that you can do, because just marketing alone, marketing is the intersection between art, and language, and music, and math. To be good at all those things is tremendously challenging, but we’re all marketers in our business, and I think the key is to again, to be aware. It’s self awareness. And to answer your question about how my productivity has moved, well I think the older we become and the more you listen, not just to your customers, and the more that you ask, not just to your customers but to yourself, applying the Ask method to yourself, constantly, day in and day out, you’d be self-aware of when you feel like you’re in flow, and when you feel like you’re out of synch. And putting yourself in a position to be more and more and more in flow, and making decisions that course-correct you in that direction, I think that is what unlocks our true potential. So today, running a large seven-figure soon to be eight-figure business, I’ve realized that there are certain things that are within my zone of genius, and they are effortless for me to do. And the things that I thought were necessary evils for my role in the company, I’ve realized that there are better than mes, right? People that are better than me at that thing, and it’s not that it gives you like a 20 percent boost in your business when you find someone to fill that role for you, it’s like a 400 percent boost in your business. It’s uncanny. And so I’ve realized and come to appreciate that the thing that’s gotten you to where you are, the thing that’s been your biggest strength, which is something that’s tied to you as an entrepreneur, that thing is also the thing that is holding you back from getting to the next level. And James, you might have even been the one that kind of knocked me over the head with that idea on one of our many private calls. And so, I’ve tried to be very hyper-aware of those things where I am getting in the way, where I think I’m like some freaking genius, like the only person in the world who can do these things, and trying to be again humble and open to the idea that you know what? There’s probably someone out there who’s literally 10 times better than me at this thing that I think I’m really good at. And I’m trying to find all of those things so that I can focus on what my true zone of genius is, and that and only that. And it’s a lot fewer things than you might expect or I might expect, but I’ll tell you man, it feels good when you’re operating in that space all day, every day, and only doing that. James: Yeah. when you’re just doing your thing, you naturally find the energy for it, right? Ryan: Yup, totally. Totally, totally. James: And I was just reading that book, Sapiens, and it talks about how we were so much more adept at multi things when we were hunter-gatherers compared to when we became specialists, so it kind of explains why we’re quite weak in multi-dimensional tasks, and we really should be trying to occupy one role and doing it really well. And for a lot of us in the entrepreneurial thing, that would be the conductor of the orchestra. Ryan: I love it. And the big shift in my thinking is, and I’ll share this here, and you and I talked about this on a call, is I’ve started to look at our company as the product that we are creating. Not just a product that we’re selling, but our company as a whole, and applying the Ask method to this entity that we’ve created, and looking at the market for this entity, in the event that someday, if we were to ever sell and exit our business, just like you sold your business, what does our market want? What is their biggest challenge, right? Apply the Ask method at this almost meta level. What are they looking for? What is the ideal product for them? What are the different segments for our potential buyers? How would I position our company to those different segments differently if I were to sell to one or more of them? What’s the marketing story, the narrative that I’m going to tell? How is it going to differ if I’m selling to a company in bucket A versus bucket B? And so what it’s allowed me to do, as I think about this, and bring it back to the teaching that we have in our programs, in the Ask method masterclass, is really look at the Ask method as something that truly is a philosophy, like it truly is a philosophy and approach that one can use to look at any challenge that you might be running into in your business, no matter how small it is, right? A simple little decision, or how to sell your company some day. It’s applicable at the macro, all the way down to the micro. And for me, it’s just a lot of fun. It’s a lot of fun to be in that space, to be able to have the head space to be thinking like that and to be applying it. James: The placard on my desk says, “Question everything.” That’s some good advice I got from a mentor. It’s been my little mini-Ask. My personal optimizer is to get into that habit of asking questions. Ryan: Love it. Love it. James: Ryan, you’ve been really generous with your time. You have brought up some great points. I didn’t want to heavily script our call today, because I wanted to share with the world some of the things that I know about you. That is that you are incredibly talented, you’ve got copywriting skills that are insane, you have taken a technique and branded it to the world; it universally works for any business, which is phenomenal, but you had the good sense to build it and put in the effort. You’ve got confidence but also you balance that with humility. You have gratitude for all the people and the resources that have helped you, that’s one thing that I love about you, is you openly share with the world people who you acknowledge on the journey, and that’s actually rare with some entrepreneurs, they want to just rename everything and call it their own. Happened from Led Zeppelin, right through to some of the popular self-help gurus. And we talked about Lego, which is important in any conversation. And we talked about some of the challenges you went through as your business has grown and continues to grow. So it’s not surprising to me that you’re successful, but I’m going to make a prediction that you’re not even close to the summit. You’re just at the foothills. You’re probably not even at the next camp up where you get into the training. But I think it will be really interesting to watch. I’m glad we could document this, I hope you’ll come back in the future and give us an update on the next installment. It might be what changes between seven and eight figures, for example, would be a great trigger point for our next call. So thank you for coming and sharing. If there’s one thing you’d like to leave on, how can someone know when they’re having an impact in the market? How do you know, what is that moment that signals to you you’re doing something worthwhile here? Ryan: Gosh, that is a very, very big question. It happens on the smallest of scales, and I’ll give you an example. So I have a customer, long-term customer, who’s been using the Ask method, and we got to talking one day on Facebook chat, back and forth, and somehow one question led to the other, and we found out that she went to the same high school that I did. She was five years older than me, never knew who I was from our town, because we never went to school together, and had learned about me through this, through Ask, through what I’m doing, and just could not believe that we knew some of the same people that were a couple of years younger than her, couple of years older than me, who were friends and siblings and that whole thing. And the fact that we grew up in this tiny little town and didn’t know each other from that town but had come full circle in this very kind of real way, and to see that and to see what she’s doing, she has a small, very modest but successful health business, helping people in the health space, and to see that and to kind of see things come full circle, it’s moments like that that are really cool. It’s moments like when you speak at an event and someone comes up to you and says, “Hey Ryan, I know people give you sh** about the first half of your book, on Amazon…” Because that’s where all the negative reviews come, on the first half of my book. I mean, there are a few people who are like, “Oh this guy’s trying to sell something in the book.” It’s like, come on, you know, what do you expect? I mean, it’s a book, you deliver value, and there’s got to be a next step. But the people who give you sh** around “Hey, the first half of the book was just a story of blah, blah, blah, blah, blah…” And you’re talking about confidence, you have to have that thick skin to turn an eye to those comments. And it just takes a few, tiny moments like that that make the hair on the back of your neck stand up, that again you go back to in your mind and replay that movie over and over and over again. So there’s days when you feel knocked down, there’s days when you want to give up, there’s days when you feel like things are tough, it’s not worth it, you should have nailed it in, and just kind of live the life that everyone else is living. It’s those moments that I revisit in my mind, and say “Yes, I’m on the right path.” And I think those are the moments that for me show that what we’re doing and what I’ve devoted my life to is having an impact in people’s lives in a real positive way. James: The impact you’re having right now in the online space, and certainly for me, I’ve mentioned this before, but I’ll never look at a website business the same way, now that I’m aware of these new tools and filters that I can apply and get rid of the losers earlier, scale up the winning segments faster. I thank you for bringing it to my attention and for involving me, that’s an absolute pleasure to have caught up in this environment. Thank You for the great stuff you’re doing, and it’s just been good that you came into my life, because I have these great ideas and you are impacting everyone in my environment. If you had any idea how many times I tell people, “Go and get the Ask book, start your deep dive survey, and then we’ll continue our conversation.” It’s become the standard now. Ryan: And I’m equally grateful, because whenever it was, two, two and a half years ago when we started working together, my business was successful but it was a heck of a lot smaller and had a much smaller footprint, and I’ve made some big, strategic decisions based on your counsel and you advising me, and I’m forever grateful for that, and we’ll be continuing to work with you as my trusted advisor. And I think that speaks volumes to you, and your mind, and your perspective, so the mutual admiration society, I’m just as grateful for everything you’ve done for me. So thank you, my man. James: Thanks, Ryan. On that note, let’s end it there.